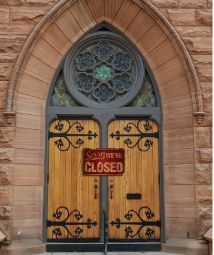 The first post in this series on the possibility of closing churches began by framing the issue as a necessary conversation that some churches must face. I now want to dig deeper into the particular question that small declining churches must wrestle with. It’s what we might call the question of discernment and it has to do with participating in the mission of God rather than preserving the existing church. Often, though not always the case, declining churches have suffered through some difficult conflict and lacking a purpose rooted in the mission of God. This creates an anxious culture where churches become inward focused. I have seen some churches dig their heels into traditionalism, while turning to self-pity and loathing the surrounding culture that they believe are simply unreachable with the gospel due to a perceived spiritual apathy. But the problem is not with the culture, it’s with the church. Other churches realize that something about them needs to change but their anxiety results in becoming concerned only with self-preservation where they will desperately and quickly chase after any means that has the appearance of possibly revitalizing their church. The problem is that if this chase fails, which it does many times, it just creates more anxiety and the more anxiety, the more desperate and unhealthy the church becomes. Neither traditionalism nor self-preservation are mission-focused and therefore do not lead to renewal of a church. What the declining church must ask is God leading each one of us to participate in his mission? While asking this question of discernment, the church must remain open to wherever that leads? As the church discerns, the church may discover a renewed calling to serve together based on the way that God has gifted the various members. If so, and the church is willing to pursue this calling by faith no matter what changes it requires then the church will likely find renewal and have a future together. Yet it may be that God is calling the church to scatter so that the different members can serve in new ways that are not possible without closing first. In other words, God may be pruning the tree by closing the church so that greater fruit will come forth. But either way, a declining church will only discover the will of God by discerning how God is leading everyone to participate in his mission. The remaining twenty-five members that made up the Columbia Church of Christ lived in five different counties (all in Maryland) throughout the Baltimore/D.C. Metropolitan area. It is difficult to serve on mission with God through a particular church that meets in a different town than the many of the members live in. There were some differences in understanding of direction for the church and what that would involve should the church have continued. This is not to say that anyone was wrong but it is an issue that cannot be ignored because for everyone to continue, a unified vision is necessary. The Columbia Church of Christ leased the space we met in on Sundays but our lease was up and since we could not commit to another long term lease, that lease was given to another young church. We did look at a couple of other options but for several reasons, neither of these options panned out. I share these three factors to say that as church’s discern together, there will be signs that suggest where God might be leading. In the next post I will discuss the discernment process in more detail and how churches can engage that process in a healthy manner. What I want to emphasize with this post is that the issue for discernment is how God is leading everyone in the church to participate in his mission. Churches who double-down on traditionalism or self-preservation will never discern this question because they are attempting to decide for God how he should work among them. But if Churches will open themselves to the mission of God… it may not lead them where they initially would like to be led but it will lead them in the way of Jesus. Rex, I have read your blog often over the last few years and commented from time to time. From what I have been reading I believe you to be a person who is truly seeking God’s heart. I have been following your soulful, wrenching struggle with the closing of Columbia and, while we do not know one another, I have lifted you, your family and the Columbia church family to God whenever I have come to read. I appreciate your courage and honesty when you speak of how some churches dig their heels into traditionalism and blame the culture. Disciples of Jesus are to be healers, not blamers. And the closing of a church may be God’s way of sending compassionate and tenders healers where they are needed most. I am one who believes that before all things can work together for those who love God, God must be recognized in all things and all things recognized in God. And I pray that every thought and act by you and your brothers and sisters of Columbia be recognized and embraced as something divinely wonderful about to happen. Thank you for reading and for sharing your very kind words!